Repeated remarks of a demeaning nature that have the purpose or effect of causing injury, discomfort, fear, or suffering to the victim. Any person who promptly, reasonably, and in good faith reports an incident of bullying or harassment under this policy to a school official, shall be immune from civil or criminal liability relating to such report and to the person’s participation in any administrative, judicial, or other proceeding relating to the report. Individuals who knowingly file a false complaint may be subject to appropriate disciplinary action. Retaliation against a person because the person has filed a bullying or harassment complaint or assisted or participated in a harassment investigation or proceeding is prohibited. An individual who knowingly files a false harassment complaint and a person who gives false statements in an investigation shall be subject to discipline by appropriate measures, as shall a person who is found to have retaliated against another in violation of this policy. A student found to have retaliated in violation of this policy shall be subject to measures up to, and including suspension and expulsion. A school employee found to have retaliated in violation of this policy shall be subject to measures up to, and including, termination of employment. A school volunteer found to have retaliated in violation of this policy shall be subject to measures up to, and including, exclusion from school grounds. The school or school district will promptly and reasonably investigate allegations of bullying or harassment. The investigator or designee will be responsible for handling all complaints by students alleging bullying or harassment. The investigator or designee will be responsible for handling all complaints by employees alleging bullying or harassment. It also is the responsibility of the superintendent, in conjunction with the investigator and principals, to develop procedures regarding this policy. This new policy comes out of our care and concern for each student’s financial well-being post high school graduation. In addition, each family will need 10 hours of engagement time on campus to meet graduation requirements. We have created a Family Advocacy department to support & assist families with challenges. Talk to your son or daughter about his or her dreams for career fulfillment. As a late teen or young adult, taking a first step toward the future is as significant a milestone as when they took their actual first steps. Support them as you talk about what will make them happy in life. Encourage them toward realistic approaches in their post-graduation plan. Remind your student frequently that they need a post-graduation plan to graduate. Our 2017 graduation was a celebrated affair. 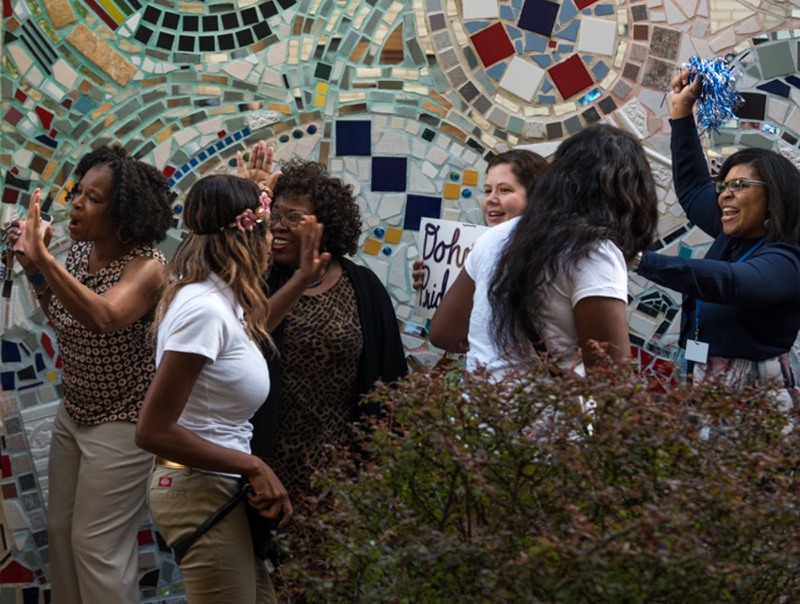 Families, students, and staff raised the roof with joy. According to the Cincinnati Fire Marshall, 600 guests had to be turned away because we were already at the 2400-person capacity at the Taft Auditorium. We anticipate an even bigger and more celebratory event for the 2018 graduation, and we want your graduating student to be on that stage. A follow-up post-graduation plan is necessary for that to happen. If you are graduating in 2018, know that a post-graduation plan — either a letter of acceptance from a college or vocational training program, or a letter of acceptance of full-time employment, or a letter of acceptance into the military — is required for graduation. This requirement supports your entry into adulthood. You become financially responsible through using your unique gifts and talents. Most people have many career paths throughout their lifetime. Making the first choice is hard. However, it is essential to get started. Talk with your family, your teachers, and your school counselors to help you narrow choices and choose a beginning path for your adult life. If you are a freshman, sophomore or junior, know that this policy is coming with your graduation. Prepare now by exploring options for a path that interests you and maximizes your interests and skills. Call on your family, teachers, and counselors and do your own research. We understand that this graduation requirement policy represents a significant change. Dohn Community High School is successful because we change with the times. We are in a world economy now. Each student has to prepare for life beyond high school in ways that future generations did not have to prepare. Our graduation requirement policy is based on a national model, a new trend in high school education. With help from school and support from home and the student’s self-inquiry, every graduate can find his or her path to a fulfilled and financially stable future. This is Dohn’s mission, and our goal. Dohn Community High School and Crossroad Health Center are in a school based health center collaboration. Students and their families can be seen at this Urgent Care Health Center, staffed by a Family Nurse Practitioner, for routine physicals, sports physicals, immunizations, and routine health care that is not an emergency. • Tell them the reason for your visit. • Please, show up on time. Students from Dohn Community High School, Dohn Prep Academy, 22+ Adult program, their children and their parents and grandparents can be seen at Crossroad Health Center. Students do not realize that when they use an emergency department for routine and non-emergency health care, one visit can cost thousands of dollars. While the student or family might not pay that, the bill can follow the student’s credit record and get in the way of buying a car or a house later on. It is also good to have a regular health care provider, one who sees you each visit and can get to know you and your health concerns. Using Crossroad Health Center costs less and is covered by most student and family insurance coverage plans. Aureal Williams, Dohn Community High School, Liaison with Crossroad Health Center. School lunch menus are posted here. Each month’s menu is also posted at every school location, for your convenience. There is a phone blast; also watch local news, Channels 5, 9 & 12, for closings of Cincinnati Public Schools. Dohn Community High School is not always listed. The student Code of Conduct is based on the idea that learning takes placed in a disciplined environment and that students have a responsibility to use the services and facilities of the Dohn Community High School for the purpose of education. Rules that regulate student behavior have been adopted by the Dohn Community High School Board of Trustees in order to operate the school in an efficient and orderly manner. Other acts not listed may exist in disciplinary action if the behavior is disruptive, hinders other students’ learning, violates the right of others or is considered to be inappropriate. Any student who engages in the following types of conduct is subject to disciplinary measures ranging from verbal reprimand, removal from school. Students found in violation of the weapons policy of the school are subject to a one-year expulsion from the school. School personnel will consider a variety of factors in deciding the discipline that should be administered to a student. Students who help other students violate the code of conduct will also be disciplined. The Code of Conduct applies to any Dohn student in the custody or control of the school, in the school building or on school grounds, in the general proximity of the school building or school grounds, at a school-sponsored function or activity or on school sponsored buses. The Code also governs student conduct at any time, both on and off school grounds, when such conduct reasonably relates to the health, safety, or welfare of Dohn students, interrupts the educational process of Dohn Community High School or another school, or in the judgment of the school officials, is considered school related. Level 1: Under level 1 punishment, the misconduct will be addressed by the teacher, and the teacher may either: (a) verbally reprimand the student; (b) provide an oral or written notification to parents; (c) issue a classroom detention; (d) conduct a teacher conference with parents; (e) separate the student from peers; (f) issue a detention; and/or (g) deny the student classroom privileges. Repeated offenses may result in Saturday School, up to a 10 day suspension or possible expulsion, as deemed appropriate by the Superintendent or his designee. Level 2: All the steps listed in Level 1, plus the following: Under level 2 punishment, if the same acts of misconduct continue or if serious acts of misconduct occur, a conference with the parent/guardian, teacher and/or principal is held in order to discuss the incident and develop an appropriate corrective incident and develop an appropriate corrective action plan and/or disciplinary action. Appropriate action may include suspension. Level 3: All the steps in Levels 1 and 2, plus the following: The pupil may be suspended for up to 10 school days. Level 4: All the steps in Levels 1, 2. and/or 3, plus the following: The pupil may be expelled for up to 80 days, unless one year is allowed or mandated by law. If you wish to see the Student Code of Conduct, you may secure a copy by contacting the school at 281-6100, ext. 1010.